The Trust has built five buildings and set up two sports grounds. 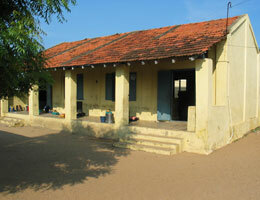 The Kovalam High School, our biggest project yet, opened in summer 2013. 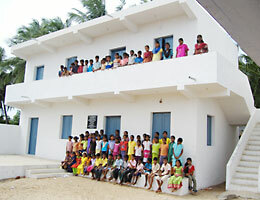 The newly opened Janakiraman Community Hall is used by our sponsored children and for village events. The splendid Government High School was built and equipped by the Venkat Trust in association with the Tamil Nadu Government. Since it was opened in January 2013, the Trust has built and equipped a state-of-the-art laboratory and library to add to the IT room and Etihad Sports Ground, alongside which is an avenue of trees to provide shade for the pupils. 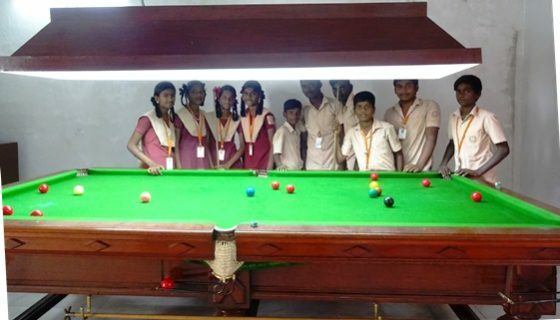 The High School now has a beautiful snooker table, donated by a generous supporter and transported to Chennai by the World Professional Billiards and Snooker Association (WPBSA).Already massively popular in India (the game of snooker was invented in Bangalore in 1875), the WPBSA is keen to develop snooker in schools where it is considered to have many educational – particularly in the field of numeracy skills – as well as recreational benefits. Children have weekly lessons from Chennai’s No 1 snooker player and one pupil recently reached the semi-final of an inter-school snooker tournament. Ours was the only government school to take part and our High School student attracted lots of media interest. 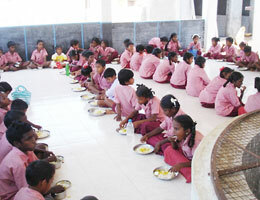 Kovalam’s village school (left) was very run down, ill equipped and overcrowded when the Venkat Trust was set up in 2004. As well as providing furniture and equipment the Trust, with the help of our supporters, has built a new classroom block, the Ganesh Building, and a covered dining/outdoor classroom area. The Ganesh Building (above right) replaced one of the original classrooms which had to be demolished after repeated flooding. A handsome two storey building, donated by CIM Investment Management, now provides a huge downstairs area and two first floor classrooms. The open sided dining hall (right) is a really versatile building. As well as being used for lunch, it’s an assembly and performance space out of the sun and a handy extra classroom. The Venkat Tuition Centre, every penny for which – land, bricks and mortar, equipment – came from our donors, is a great success and a real focal point in the village. Over two floors, there are three large rooms, including the main Admin Office – all of which were separately sponsored – plus JR’s office. Sometimes the Tuition Centre is used as safe ground when the school, which is on lower ground, is flooded. 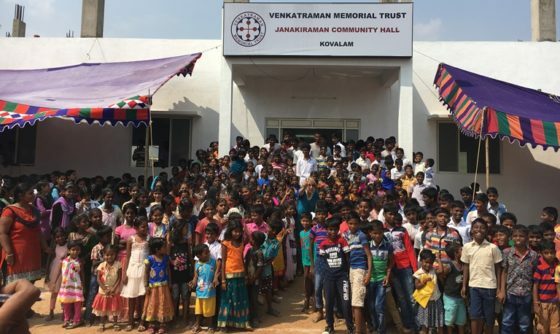 Built on land bought by the Trust in the middle of the village, The Janakiraman Community Hall is the focus of sponsored children’s activities and where they get together every Sunday. 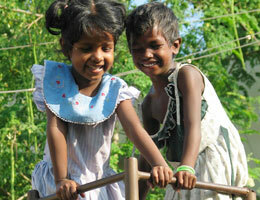 Alongside is a playground, used by Panchayat Primary children as well as for the hugely popular annual VMT Sports Day.